How is semantic knowledge represented and stored in the brain? A classic way of addressing this question is via single-case studies of patients with brain lesions that lead to a unique pattern of deficits. Agnosia is the inability to recognize some class (or classes) of entities such as objects or persons. Agnosia in the visual modality is most widely studied, but agnosias in the auditory and olfactory modalities have been reported as well. A key element is that basic sensory processing is intact, but higher-order recognition of complex entities is impaired. BA is a dedicated amateur birder with some 30 years’ experience, including around 10 weeks each spring spent in birdwatching expeditions and over the years had also regularly attended courses in bird call recognition, visual identification and bird behaviour. He had extensive exposure to a range of bird species representing all major regions and habitats of the British Isles. He had noted waning of his ability to name birds or identify them from their calls over a similar timeframe to his evolving difficulty with general vocabulary. At the time of assessment, he was also becoming less competent at identifying birds visually but he continued to enjoy recognising and feeding the birds that visited his garden. There had been no suggestion of any difficulty recognising familiar faces or household items nor any difficulty recognising the voices of telephone callers or everyday noises. There had been no evident change in BA's appreciation of music. BA's brain showed a pattern of degeneration characteristic of semantic dementia, with asymmetric atrophy affecting the anterior, medial, and inferior temporal lobes, to a greater extent in the left hemisphere. Fig. 1 (modified from Muhammed et al., 2018). Note that L side of brain shown on R side of scan. Coronal sections of BA's T1-weighted volumetric brain MRI through (A) temporal poles; (B) mid-anterior temporal lobes; and (C) temporo-parietal junctional zones. There is more severe involvement of the left temporal lobe. The authors developed a specialized test of bird knowledge in the auditory, visual, and verbal modalities. The performance of BA was compared to that of three birders similar in age and experience. 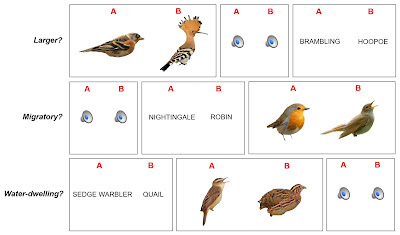 Results indicated that “BA performed below the control range for bird knowledge derived from calls and names but within the control range for knowledge derived from appearance.” There was a complicated pattern of results for his knowledge of specific semantic characteristics in the different modalities, but the basic finding suggested an agnosia for bird calls. Interestingly, he performed as well as controls on tests of famous voices and famous face pictures. This analysis transcends the effects of acquired expertise and illustrates how single case experiments that address apparently idiosyncratic phenomena can illuminate neuropsychological processes of more general relevance. Caramazza A, Mahon BZ. (2003). The organization of conceptual knowledge: the evidence from category-specific semantic deficits. Trends Cogn Sci. 7(8):354-361. Muhammed L, Hardy CJD, Russell LL, Marshall CR, Clark CN, Bond RL, Warrington EK, Warren JD. (2018). Agnosia for bird calls. Neuropsychologia 113:61-67. Warrington EK, McCarthy RA. (1994). Multiple meaning systems in the brain: a case for visual semantics. Neuropsychologia 32(12):1465-73. Warrington EK, Shallice T. (1984). Category specific semantic impairments. Brain 107(Pt 3):829-54. 1 I'm using this nomenclature as a shorthand, obviously, as many more researchers have been involved in these studies. And this is an oversimplification based on the origins of the debate. 2 In fact, the always-argumentative Prof. Caramazza gave a lecture on The Representation of Objects in the Brain: Nature or Nurture for winning the Fred Kavli Distinguished Career Contributions in Cognitive Neuroscience Award (#CNS2018). Expert live-tweeter @vukovicnikola captured the following series of slides, which summarizes the debate as resolved in Caramazza's favor (to no one's surprise).